Most people buy a canary to enjoy his song, but canaries also make good companions. They are lively, intelligent birds who respond to patient, consistent training. Before you can start the (sometimes lengthy) process of hand-taming, your bird must come to accept you as a benevolent presence. The first step in getting to know your canary is to give him the right housing so he feels at home with you. Canaries prefer rectangular cages to round ones. This gives them room for exercise. Canaries like to fly back and forth in their cages. Your canary's home should be at least 18 inches wide, by 18 inches high and 18 inches deep. Locate it against a wall in a corner. If he's near a window, make sure the cage doesn't receive direct sun, which can overheat your bird, and that it isn't exposed to drafts. Provide good-quality perches that offer support for his feet. Settle your bird in his cage, and give him a few days to adjust to his new surroundings after you bring him home. Spend time each day talking softly to him while sitting near his cage. When he's comfortable, you'll see him listening and moving toward you. If your bird is a male, he may begin to sing. Female canaries don't sing, but they do chirp. When your bird feels at home, he'll begin to respond to you with sounds. Keep your canary in a room that is active, so that he is part of the household. His cage should be just below your eye level—not too high or too low. Canaries can easily feel threatened and are territorial birds. Don't put a mirror in your canary's cage. He will think it's another bird that won't respond to him and feel frustrated. Give him toys he can pull and tug on, such as beads and string. 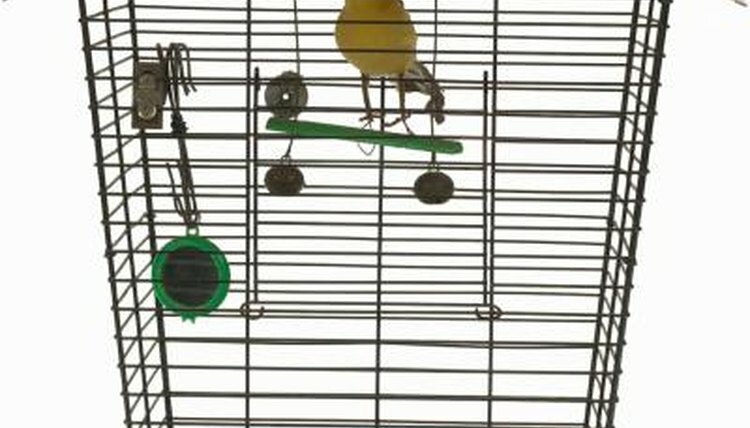 Talk to your canary whenever you're near his cage. Predators approach silently, so your bird will become comfortable with you faster if he hears your voice frequently. Make different noises for your bird. Play a recording of canary song when you aren't nearby. Your bird will become social quickly when he feels at home and ready to make friends with you. A canary's life-span is governed by the schedule of daylight. Many birds come from stores where there is no natural daylight. Your bird needs darkness and quiet from sunset to sunrise to be healthy. If his cage is located in a room where lights or a television are used, cover the cage at sunset with a cover that is heavy enough to block out light. His daily schedule should mimic the hours of daylight and darkness, no matter the season. Keep your bird's routine regular so he will be happy and well adjusted.